Home > Op-Ed > Does Singapore Have a Reason to Refuse Refugees? 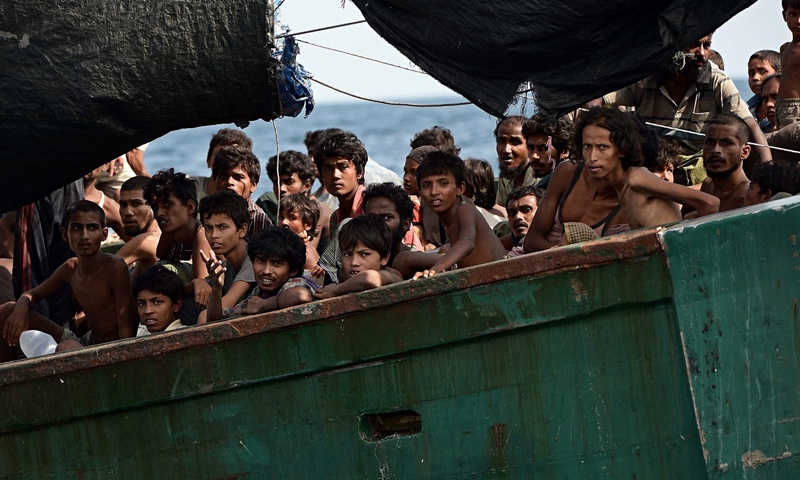 The current migrant boat crisis in Southeast Asia involving Myanmar’s persecuted Rohingya minority and poor Bangladeshis has caught the world’s attention. While there have yet to be any reports of boats entering into Singapore waters, the government has pre-emptively stated that the country “is not in a position to accept any persons seeking political asylum or refugee status”. This position was tested two and a half years ago when a Vietnamese-registered vessel carrying 40 Burmese asylum seekers arrived on our shores. They had been rescued in the Bay of Bengal after the ship they were on, the Bangladesh-flagged Nayou, sank. The survivors were denied entry by Singapore authorities. The denial of entry for refugees and asylum seekers is often attributed to Singapore’s limited land size and the country’s unpleasant experience dealing with refugees in the 1970s. However, these do not stand up under closer scrutiny. Limited land space is a reason that Singapore commonly argues to justify its inability to accept individuals seeking refugee status. Singapore is one of the smallest countries in the world with a total land area of about 715 square kilometres and a population of 5.47 million, making the city-state one of the most densely populated countries. An influx of refugees and asylum seekers will undoubtedly add to the already strained national infrastructure. This means an increased demand for housing, further congestion on roads and the continued tightening of shared space citizens have to enjoy. However, the adoption of the Population White Paper in 2013 has demonstrated that sheer numbers might not be the problem. According to the Population White Paper, Singapore plans to increase the present population to between 6.5 and 6.9 million by 2030. The government argues that Singapore’s land area has grown by 23% since 1965 and ongoing investments into infrastructure facilities and land capacity has enabled us to comfortably sustain an expanded population. Given that, the Singapore government’s scarcity-based reasoning for barring refugees and asylum seekers appear unsupported by their own rhetoric. With ambitious projects to accommodate more people already underway, the government should be able to allow at least some of these refugees in. While the government may want to be more selective about who absorbs this additional capacity, these individuals have a special need for protection that should afford them equal, if not priority, consideration. Another factor driving Singapore’s closed-door policy is the unpleasant experience they had in the 1970s in assisting with the Vietnamese refugee crisis. With nearly a million Indochinese people fleeing extreme disorder for neighbouring countries, the Singapore government formulated guidelines to control the admission of incoming boat people. In 1978, Singapore and the United Nations High Commissioner for Refugees (“UNHCR”) entered into an agreement to provide refugees with international protection. Singapore agreed to set up a transit camp on Hawkins Road to allow a maximum of 1000 refugees to stay for a period not exceeding 90 days at any given time. Refugees were not permitted to disembark unless and until the UNHCR Representative provided a written undertaking to promote as soon as possible a permanent solution, in particular, their resettlement to a third country. At the same time, the UNHCR Representative had to certify that refugees were being processed by a foreign mission in Singapore. This process, described as the “guarantee system”, guaranteed resettlement for all refugees after their rescue and arrival into Singapore’s port. Following a conference on Indochinese refugees in 1989, the Comprehensive Plan of Action was implemented to screen all refugees and repatriate those not found to be genuine. While foreign missions in Singapore continued to provide guarantees for all new entrants, those who did not meet the requirements for refugee status were not granted resettlement. As a result, Singapore was left with the responsibility of hosting rejected asylum seekers until they were repatriated. For years, many refused to return home voluntarily. In fact, strong resistance to repatriation drove 72 rejected asylum seekers to break out of Hawkins Camp and protest outside the UNHCR office. Others attempted suicide and went on hunger strike. Because of this “bitter” experience and resettlement countries’ “broken promises”, Singapore announced at the closing of the camp in 1996 that refugees would no longer be allowed into the country even if a third country pledged to take them in. While this experience could be a concern, it is not substantial enough a reason to restrict the entry of refugees and asylum seekers. Singapore should choose instead to adopt safeguards to avoid a similar outcome rather than simply close off. For instance, Singapore can establish an asylum recognition system to adjudicate the claims of applicants, set up a clear repatriation processes and outline the rights of applicants whilst in the country. Eventual admission into the state of those granted refugee status can be assessed on the basis of the overall number of applications, the impact that temporary or potentially long term accommodation of refugees will place on existing citizens, the qualifications and skills of refugees and whether there exists any special link between refugees and the local community such as similarities in language or culture. The decision to allow or refuse the admission of refugees can, in some cases, determine whether they live or die. To turn them away is to deny them a chance to live or make a life for themselves. With this in mind, Singapore must reconsider its position. Denying them entry on the basis of an unpleasant historical experience or limited land space is not sufficient, particularly when lives hang in the balance. Jerry Lewis Ong works for an NGO in Singapore and has spent time working with refugees in Malaysia. Part of this op-ed is based off his Singapore Management University Senior Thesis which received the 2013 Helen Chua Chin Xiang Best Senior Thesis for Political Science award.